U.S., Russia Agree To Syrian Cease-Fire : The Two-Way The truce, for a section of the country's southwest, also includes Jordan and Israel. Several such cease-fires in the past have been short-lived. 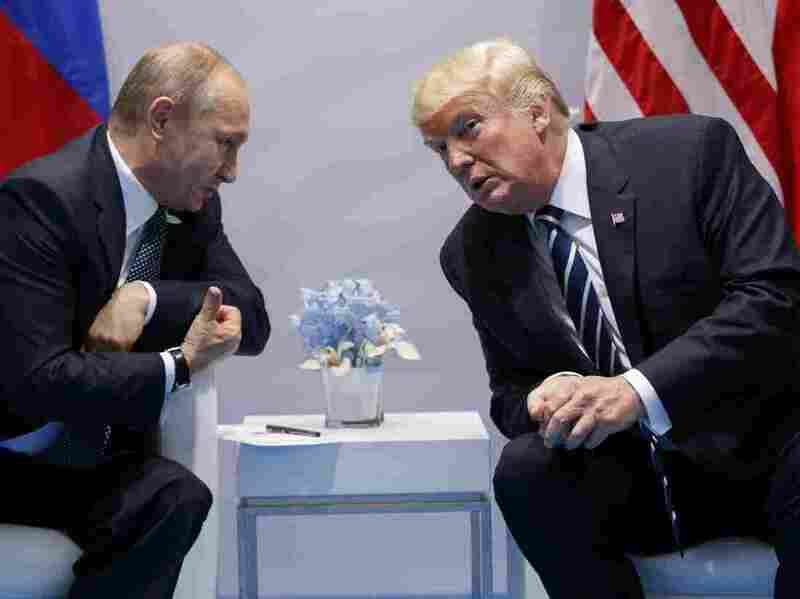 President Trump and Russian President Vladimir Putin at the G-20 Summit on Friday. Shortly after they met, the United States said the two countries had agreed to a cease-fire in southwestern Syria. Secretary of State Rex Tillerson has confirmed that the United States and Russia have agreed to a cease-fire in southwestern Syria. Tillerson — speaking to the press following a much-anticipated 2 1/2 hour meeting between President Trump and Russian President Vladimir Putin — said the agreement was set to take effect on Sunday. Jordan and Israel are also part of the deal, the Associated Press reports, quoting an unnamed U.S. official. The secretary of state told reporters that although Washington and Moscow have had conflicting views on Syria in the past, that Russia has "an interest in seeing the Mideast nation become a stable place." According to the AP, the deal is separate from "de-escalation zones" that were part of an agreement among Russia, Turkey and Iran earlier this year that did not include the United States. The AP writes: "Earlier in the week, Syria's military had said it was halting combat operations in the south of Syria for four days, in advance of a new round of Russia-sponsored talks in Astana [Kazakhstan]. That move covered [the] southern provinces of Daraa, Quneitra and Sweida. Syria's government briefly extended that unilateral cease-fire, which is now set to expire Saturday - a day before the U.S. and Russian deal would take effect." Tillerson added that Washington "sees no long-term role" for the family of Syrian President Bashar Assad. The latest cease-fire would be the fifth such attempt among various combatants since last year. -- A cease-fire that went into effect in February 2016 involved the United States and Russia. A month later, Putin announced that Russia was pulling out of the deal amid a major Moscow-backed push by Syrian-government forces to retake territory captured by the Islamic State. -- In September, Russian Foreign Minister Sergey Lavrov and then-U.S. Secretary of State John Kerry announced a similar truce, but it quickly disintegrated. -- On Dec. 28, Turkey and Russia agreed to a cease-fire. It immediately began to unravel despite commitments to honor it as late as March of this year. -- In May, Russia, Iran and Turkey signed an agreement in Astana to create "de-escalation" zones, which have enjoyed some limited success. But many groups, including Syrian Kurdish forces, have declined to respect the agreement. The British-based Syrian Observatory for Human Rights says the conflict has killed nearly a half-million people and displaced millions more.